Vineyards in Meursault, home to many of the Coche family’s prime holdings. Welcome to the latest installment of my on-going series about the winemaking families of Burgundy! Be sure sure to check out previous editions about the Boillot, Morey and Gros families. If you have any suggestions for future editions (or know anything I missed! ), feel free to leave a comment below. Through Léon’s grand daughter, some of the Coche family holdings are now in the hands of Domaine Roulot. In the 1920s, Léon Coche started his domain after acquiring six parcels in Meursault, Auxey-Duresses and Monthélie. While he did some estate bottling, most of his grapes were sold to négociants. On his passing, the estate was inherited by his 3 children–Julien (who already had founded his own estate in 1940), Georges and Marthe. Georges took over his share of the family estate in 1964 and expanded his holdings with parcels in the Volnay Premier Crus of Clos des Chênes and Les Taillepieds. Georges’ son, Jean-François Coche, assumed the domain in 1972 and appended the maiden name of his wife, Odile Dury, in 1975. In his nearly 40 years at the helm, Jean-François elevated Domaine Coche-Dury to “cult wine” level. Along with Comtes Lafon, Jancis Robinson describes the estate as one of “Masters of Meursault”. 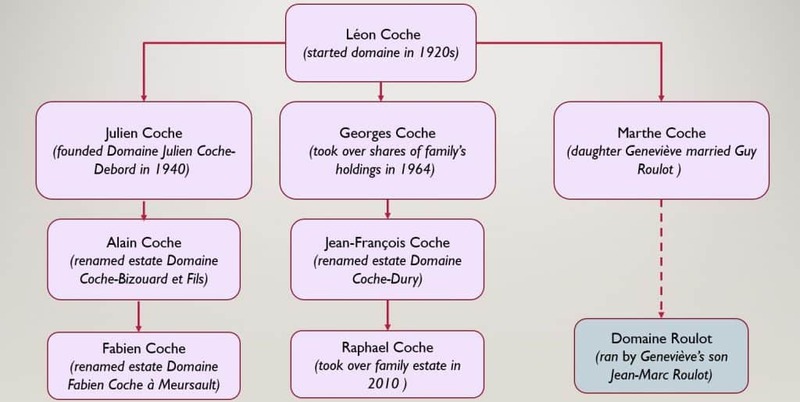 In 2010, Jean-François’ son Raphael took over the family domain as the fourth generation of Coche. The inheritance of Léon’s daughter, Marthe, eventually passed to her daughter Geneviève who married Guy Roulot of Domaine Roulot. That estate is now ran by their son, Jean-Marc Roulot. In 1940, Julien Coche founded Domaine Julien Coche-Debord with just a single hectare in Meursault. The estate was expanded with some of his inheritance from his father Léon and was further enlarged when his son, Alain, took over added several notable Meursault premier crus like Les Charmes and La Goutte d’Or. Alain also changed the name to Domaine Coche-Bizouard et Fils. Alain’s son Fabien joined the family estate in 1991 and started a négociant firm (Maison Coche-Bouillot) in 2001. Up through at least the 2013 vintage, wines have been produced under the label Domaine Alain Coche-Bizouard but now the estate is known as Domaine Fabien Coche à Meursault. Domaine Fabien Coche à Meursault/Maison Coche-Bouillot (Meursault) The estate formerly known as Domaine Coche-Bizouard et Fil and the négociant firm of Alain’s son Fabien. In addition to their holdings in Meursault, the estate also owns parcels in Auxey-Duresses, Monthélie and Pommard. The entire estate produces around 50,000 bottles. Domaine Coche-Dury (Meursault) Ran today by Raphael Coche, son of the legendary winemaker Jean-François Coche. The estate bottles more than 70% of its holding. Négociants like Louis Latour and Louis Jadot often purchase the rest. The winery farms the estate’s holdings sustainably with an annual production of around 50,000 bottles. Tagged Alain Coche, Auxey-Duresses, Bâtard-Montrachet, Benjamin Lewin, Bill Nanson, Burgundy (Guides to Wines and Top Vineyards), Charles Taylor, Clive Coates, Clos des Chênes, Coche family, Comtes Lafon, Corton-Charlemagne, Domaine Coche-Bizouard et Fils, Domaine Coche-Dury, Domaine Fabien Coche à Meursault, Domaine Julien Coche-Debord, Domaine Roulot., Guy Roulot, Jancis Robinson, Jean-François Coche, Keeping up with the Joneses in Burgundy, La Goutte d’Or, La Platière, Léon Coche, Les Charmes, Les Genevriéres, Les Perrières, Les Perriéres-Dessus, Les Taillepieds, Louis Jadot, Louis Latour, Maison Coche-Bouillot, Making Sense of Burgundy, Matt Kramer, Meursault, Monthélie, Pommard, Remington Norman, The Finest Wines of Burgundy, The Great Domaines of Burgundy, The Wines of Burgundy, Volnay.